One of the biggest issues businesses experience when trying to train their staff is the lack of engagement from participants. Just like the “First Day Syndrome” when nobody wants to stand up and introduce themselves to the group, people don’t like being outside of their comfort zone. 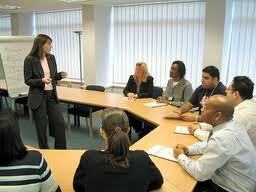 So how do you make sure your staff members are fully engaged in your training programme? Before you examine your training material, you need to think about who is delivering it and assess whether or not is delivered with the correct attitude and enthusiasm. Okay, so it is not easy being enthusiastic about a health and safety video, but it is quite acceptable to inject a bit of humour as long as the correct message hits home at the end when the video is summarised by the course tutor. One of the most off-putting features of a training programme is the trainer talking endlessly without garnering responses from the audience. Taking in information is difficult when you receive fact after fact with little feedback for extended periods. Most trainers accept that people will only absorb a certain amount of information delivered in a certain way. The use of power point presentations or hand outs help a little, but if training revolves around them, your students are just as likely to ignore half of them as they are to read through every one. Training manuals intended for staff to take away and learn in their own time are even more unlikely to be effective. The most effective way of teaching is stimulating the senses because this aids memory retention. Videos may be great teaching aids and they are usually stimulating, but do you believe a lifting techniques demonstration video is stimulating anything but a sleep response? People engage in the training more with a live demonstration and a few blushes and a little humour will reap benefits. It is a fact that people remember what they do better than they remember what they see. That is why using a ‘show and tell’ method of training is far better than a standard delivery of training materials. So while it is important to have the facts covered, it is equally important to have people experience the process with as many of their senses as possible. While smell and taste are difficult to introduce into training programmes, touch, sound and sight should all form a part of your programme. That means touch needs to be included as much as possible to even the balance out with sight and sound. In other words, more action and less video. When you have the delivery of your course nailed down, you need to move on to assessment. People automatically apply themselves if they believe they are going to have an assessment at the end. How you assess is just as important as how you deliver. If you simple collect in a handful of papers with multiple-choice answers ticked, you should consider how engaging that process is and whether or not it is improvable. Having peers assess each other is a good idea where practical and you can introduce this effectively when people are performing live demonstrations in front of each other. Working as teams can also aid ongoing assessment and asking each team member to assess a member of another team is an effective way of producing anonymous peer assessment. Most of the time people will be generous because that is what they would want their assessor to do for them, but just make sure you state that all criticism should be constructive and include a version of how the assessor would change things.